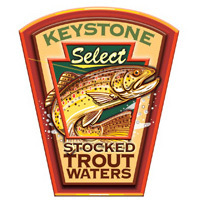 Trout anglers who want an experience targeting bigger fish will have the opportunity to catch 14”-20” trout in eight Keystone Select Stocked Trout Waters, a new program launching this year by the Pennsylvania Fish and Boat Commission. Under the new program, approximately 3,200 large trout will be distributed among the eight waters, one in each commissioner district. The trout will be stocked at a rate of up to 250 trout per mile, which is comparable to the numbers of fish of this size in Pennsylvania’s best wild trout waters.